Down true blue Wandsworth way back in 2007 there was a trial of an initiative called “Movers and Shakers”. What it did was to provide bike [cycling] training for community leaders and role models and then ask them to share their experiences with the community. 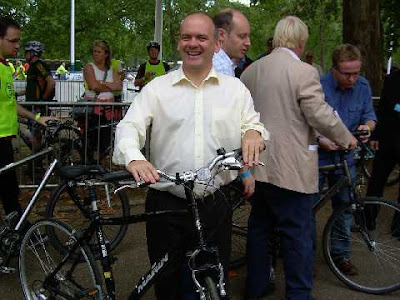 It was a major success, not surprising given how [some] notable Tories like to ride bikes, OK we will ignore Mr Coleman. So much so that the Redbridge branch of the London Cycling Campaign [LCC], are due to launch a similar project here in Bluebridge Redbridge this month, March 2009 running until June 6th when there will be a Movers and Shakers ride led by a celebrity [?] at the Redbridge Cycling Centre. The first Mover and Shaker to be invited is Roger [two pies] Evans, Redbridge and Havering London Assembly Member and leader of the Conservative Group at City Hall. Note: You don’t have to be blond(e) and wear a medallion or sling backs: but apparently it helps according to a certain northern ecky thump Labour MP - via Dizzy. Provide direct experience of cycling to community leaders via one-to-one tailored cycle training . Enable community leaders from a variety of backgrounds to act as role models to tell others about cycling. Provide help with telling others about cycle training/cycling experience. A professional cycle trainer will then contact participants to arrange a minimum of two hours' training at their convenience, with a promise of more sessions if desired. It's not so much Movers & Shakers as Movers & Droopers. Guys, ignore this daft fashion for peddling. There is scientific evidence that links too much bicycling with impotence. Peddle today and it's Viagra tomorrow. Leave it the women. Can anyone lend me some bike clips?